“Field of Dreams” was more than a movie about baseball. It was a story about a father and a son bridging a divide, rediscovering a paternal bond and establishing common ground. The common ground in the movie just happened to be located in deep center field. For moms, dads, boys and girls, recording the hits, runs and strikeouts in the KeepScore Baseball Scorebook is only the tip of the bat. By participating in this family activity, they can widen the boundaries of their relationships beyond the first and third base lines. We believe that keeping score together is a great warm-up for communicating and engaging each other outside of the ballpark. For parents involved in youth baseball, the Scorebook begins to capture the detail that will tell a story of your boy’s or girl’s development as a player. So you will be able to determine at an early stage if his or her baseball or softball career might take them to the next level. In addition for young fans, the Scorebook teaches valuable comprehension skills, like graphic interpretation, basic geometry concepts, numerical correlations, the use and understanding of symbols, as well as scoring functions that serve to mesh both the right and left brain. 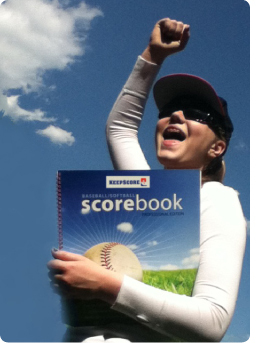 Teams, leagues and organizations can use the KeepScore Baseball Scorebook to promote youth programs and to conduct contests for scoring accuracy.